Here is the reasoning behind my opinion: Gold is strong right now because it is getting interest as a safe haven during the recession. People are scared away from stocks, real estate and bonds since they've all been battered. The interest rate is at historic lows so safe investments like treasuries and CDs are not too appealing. So many people turn to gold thinking its safe and has high / increasing value. Gold has boomed for years and is due to bust. There is nothing in the market really keeping gold prices up other than high demand. There is no shortage of the metal for its normal uses. 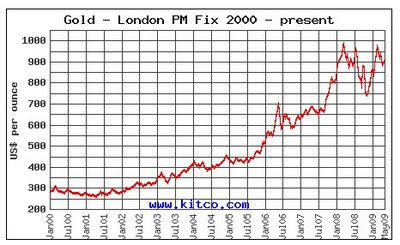 The run up and current high value of gold is based on market supply/demand inflated by speculation and high demand. As soon as the recession turns around the market for gold will drop off and the prices will fall too. But again all this amounts to is my opinion. My opinion on such matters are really no better than anyone elses.